I’ve got to say, there is a disturbing lack of cookie recipes on Katiebird Bakes. 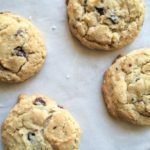 So far all we have to represent the cookie category are banana breakfast cookies, chocolate chip cookie sticks, and of course, the original (and still my favorite) chocolate chip cookies. 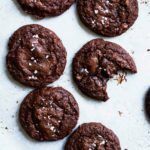 All excellent recipes in their own right, to be sure, but the fact remains that there is an undeniable lack of cookies on this blog. I intend to rectify that situation, starting now. 2018 goals?? 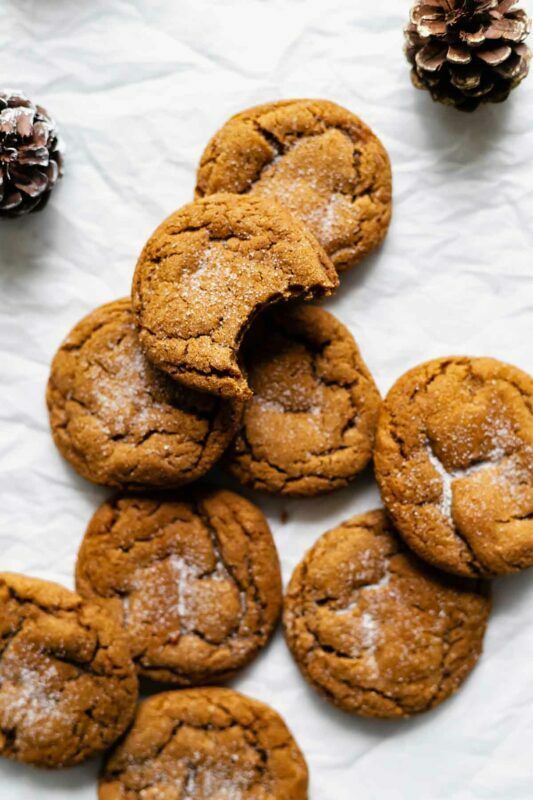 I think there’s no better place to start than my personal favorite holiday cookie: the molasses cookie. I get that it may not be your favorite holiday cookie; I get that it may not be a lot of people’s favorite holiday cookie. I suppose it’s understandable, when you have peanut butter blossoms and colorful sugar cookies and all manner of pepperminty chocolate things competing for attention. 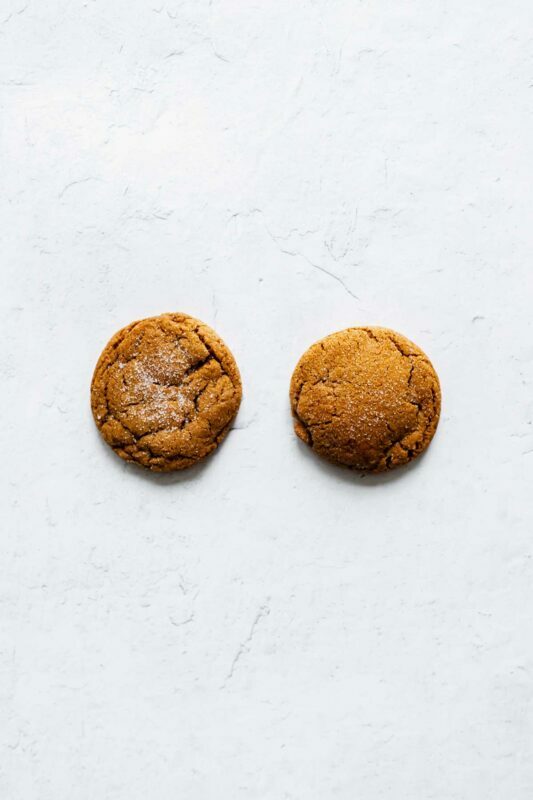 The humble molasses cookie does often get pushed to the side. I get it. 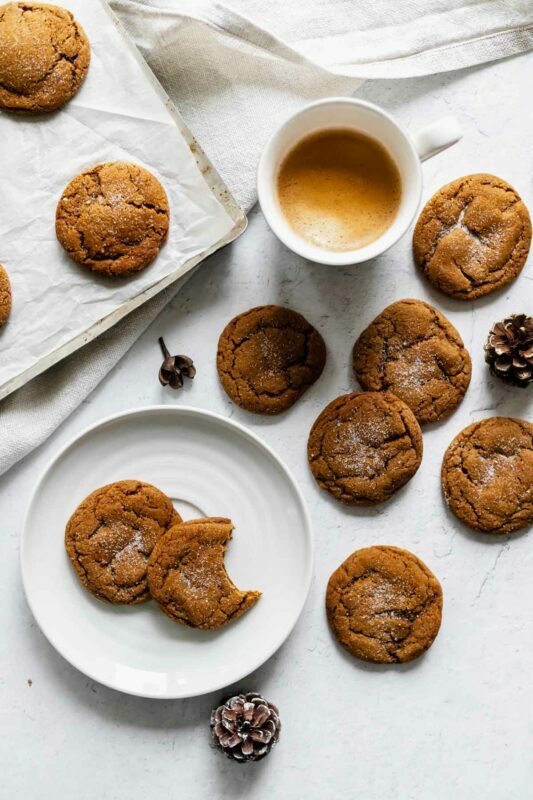 Today we are going to celebrate this unassuming, crackly brown cookie for all the glory that it is: a warmly spiced, soft-centered, crispy-edged, sparkly hug. That’s right, a cookie hug. 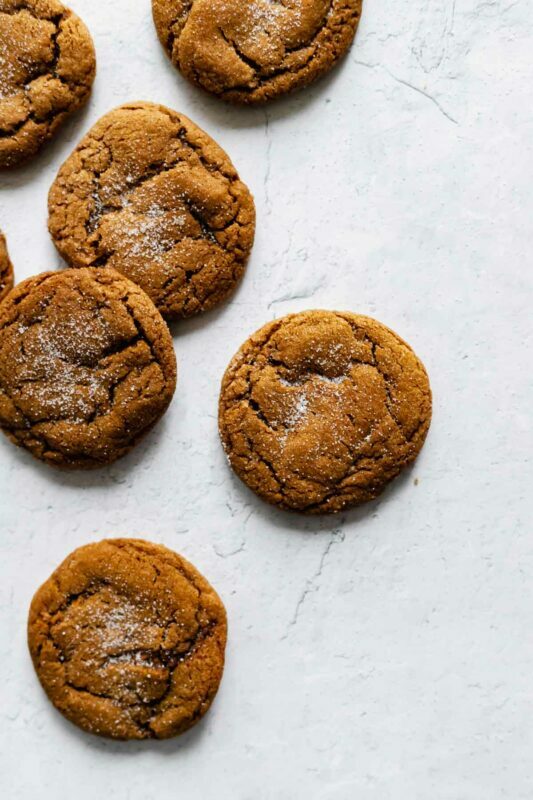 I don’t know when I fell in love with molasses cookies, but I’m pretty sure this love will last a lifetime. They’re just so comforting and friendly, yet a little spicy. There’s a lot of subtlety to them, a lot of intrigue. I’m a big fan of intrigue in my baked goods. Not so much in my Christmas movies. Recently, Brian and I have subjected ourselves to the ever-growing gamut of Netflix original Christmas movies, where there is a decided lack of intrigue but a bounty of hilariously bad plotlines. No, we’re not one of the 53 people whom Netflix recently trolled for watching “A Christmas Prince” 18 days in a row. Luckily, they haven’t yet trolled people who watch Gilmore Girls 18 days in a row. Listen, the holiday season can be tough. It’s always been my favorite time of year, but sometimes it can be a little much – a little too much sparkle, a little too much sugar, a little too much socializing, a little too much travel. For us this year, definitely too much travel (we’re talking every weekend since — and including — Thanksgiving). Sometimes all I want to do in the middle of this holiday marathon is sit under a blanket with my flannel PJ pants on, a plate of molasses cookies in front of me, a large coffee in my lap, and binge watch something so I don’t have to think or interact. Hopefully I’m not alone. We all do a lot! We deserve some me time. And we deserve these cookies. 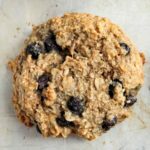 The good thing is, in the world of cookies, there are difficult ones and easier ones, and these are of the “easier ones” type. No softening butter or separating eggs or refrigerating time necessary. All we do is whisk the dry ingredients together, then beat the wet ingredients together, then combine them. Roll them into balls, coat them in sugar, bake for 10 minutes or less. 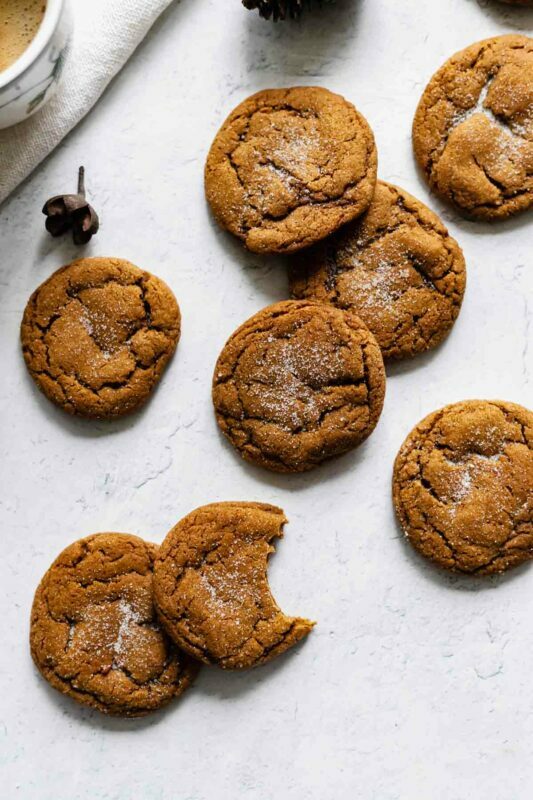 Emerge with crackly, spicy, softest-ever molasses gingerbread cookies. Congratulate self. The other great thing about these cookies? They stay fresh and soft for a super long time. Like 5 days long. Just keep them well wrapped (I keep them in a small tupperware container) so they aren’t exposed to a lot of air, and these little bundles of joy will stay soft for-ever. I’m thinking they would be perfect homemade Christmas gifts in little bags or jars, if you’re into that sort of thing. I know I wouldn’t mind receiving one. I wish you the most wonderful, stress-free, worry-free, cookie-filled Christmas and holiday season! 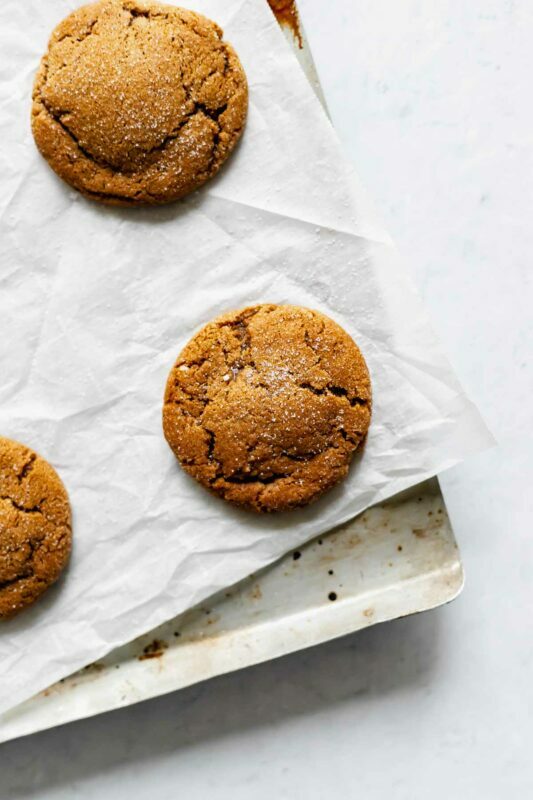 These soft molasses cookies are everything Christmas cookies should be: warm spices, soft middles, and a crispy exterior. Preheat your oven to 375 degrees F. In a medium bowl, whisk together flour, baking soda, salt, cinnamon, ginger, cloves, and cardamom. Set aside. In a large bowl, beat together egg, melted butter, sugar, brown sugar, and molasses with a hand mixer or stand mixer, on medium to medium-high speed, until fluffy and well combined -- about 2 minutes. While mixer is running on its lowest speed, slowly add flour mixture a bit at a time to the molasses mixture. Don't dump the whole thing in at once or you'll have flour everywhere. Stop when the mixture is just combined - don't overbeat. Put some coarse or granulated sugar in a bowl or on a plate (I used turbinado sugar). Use a tablespoon scoop to scoop out dough, then roll into a ball between your hands. Roll the ball in the sugar until it is coated, then place on a cookie sheet lined with parchment paper. Repeat with remaining dough, keeping balls about 2 inches apart on the cookie sheet. Bake for 8-10 minutes, until cookies are puffed and spread, and cracks have developed on the tops. Cool on cookie sheet for 5 minutes, then remove to a rack to cool completely. Adapted from the recipe on the back of the Grandma's Molasses container. Cookies will keep and stay soft, well wrapped at room temperature, for up to 5 days! Gah. Those crinkle crackles. They get me every time. I would die to have a dozen of these in front of my face right at this moment. They look SO amazing and full of rich flavor! Thanks Karly! 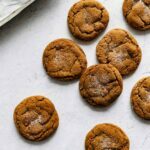 Molasses is my favorite flavor bomb! Thank you for this recipe. 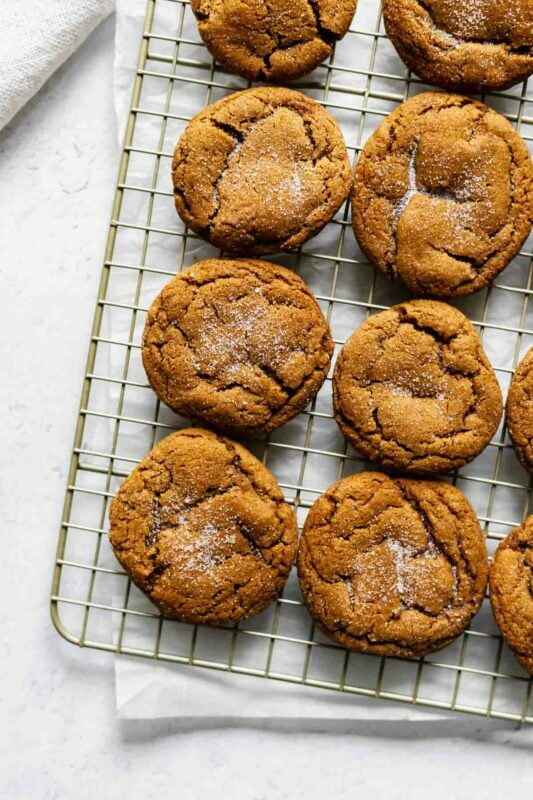 We have a wonderful friend who loves molasses cookies. He’s been a bit “out of sorts” lately (January can do that to you), so I’m making these cookies to cheer him up and let him know that we love him. That sounds like a wonderful idea, Linda! Hope you and your friend love them.